Reports from various Sierra Leonean outlets confirm that the Mabang Bridge has fallen down and 34 people are said to have been killed. "As soon as the news broke on national TV last night that Mabang Bridge collapsed killing 34 people, President Koroma immediately instructed me to send a team up there to the scene. The team arrived at 3 am this morning. 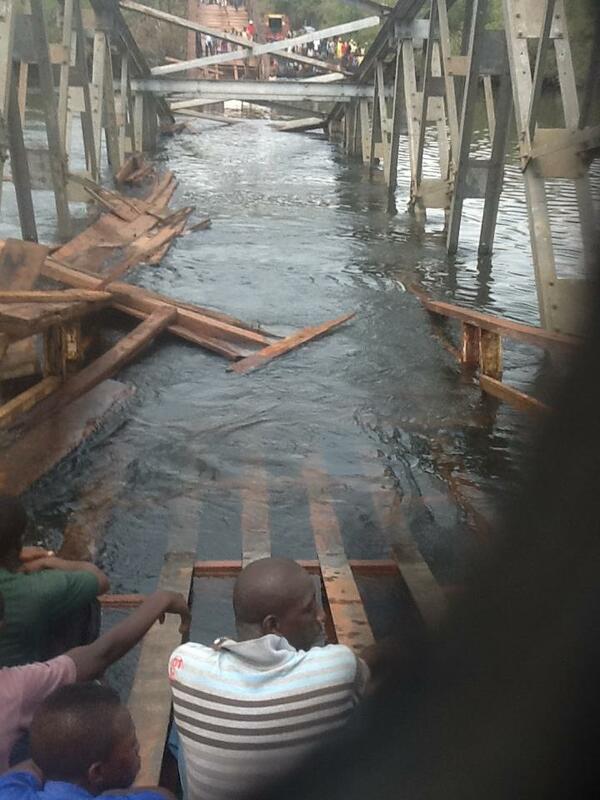 According to their initial report, it is true that the bridge collapsed. It is however not true that 34 people died. Initial report says no one died. I am going up there myself shortly as instructed by the President. I expect to be on the scene by midday. Will update on my return." "This bridge is the boundary between Koya chiefdom in Port Loko and Rebi chiefdom in Moyamba Districts; from the direction of Waterloo and Songo," wrote Isata Mahoi on VOSL. "It has been a trap for years. The moment a car steps on those timbers they start shaking. I was always afraid to go through that bridge in a car." "Early the next morning, I set off to see Mabang College. After passing through my hometown of Waterloo, we take the unpaved road leading to Songo and then on to Moyamba. The driver is informed that once we get across the Ribbi River Bridge, we would arrive in the village of Mabang. We eventually arrive at the bridge and have to come to a halt. While the bridge structure itself looked old but sturdy, the driving surface left a lot to be desired and was almost enough to make one consider not going any further with the trip. However a guide was on hand to precede us across the bridge, arranging the timber planks to ensure they were directly below the wheels. This did not necessarily ease the fears of traversing it and once we were safely across." More than a dozen January's ago, an IRIN report Mabang Bridge reopened trumpeted the news that the strategic Mabang bridge linking Freetown to the Eastern and Southern provinces had been reopened after repairs funded by international donors. The 203-mt long and 3.5-mt wide bridge had been temporarily closed by the RUF [Revolutionary United Front] and army renegades known as the West Sides Boys. It was remodeled by the Sierra Leone Roads Authority and the UN [United Nations] Mission in Sierra Leone (UNAMSIL), with money from the European Community and the UN World Food Programme. "I recall that the [fir]st bridge was a Railway Bridge and tragically an accident occurred on it causing fatalities in the 1960s. The British Ministry of Defence promptly despatched engineers who repaired it and it again became operational. When we stopped using the Railway, motor vehicles started to use it. So in fact it has been in use for over 50 years... I doubt if any regular inspection or maintenance was being carried on it or any other bridge for that matter. I do trust that our Chinese friends will help us to build a stronger [and] better structure this time."